Pearl 95 Motor Yacht makes headlines Internationally : Atlantic Yacht & Ship, Inc.
Pearl 95 makes headlines! First, the 95 Pearl was awarded “best layout” at the Cannes Yachting Festival. 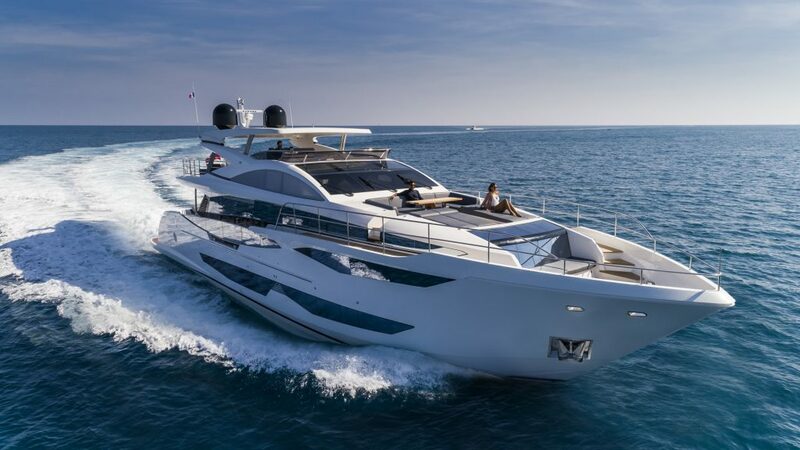 Then, Yachts International awarded her Best of 2018 overall in her size range. Now, the 95 Pearl is featured in this month’s issue of Yachting Magazine! It’s no surprise the Pearl 95 is making headlines worldwide! The Pearl 95 Motor yacht is a true work of art. Her exterior was designed by award-winning naval architect, John Dixon. Her interior is a Kelly Hoppen original. The 95 Pearl Motor yacht combines many features only found on much larger yachts. For example, she has sole to ceiling side doors that flank the main salon. Large doors and windows make an already massive interior space open to the sea. The Pearl 95 Motor yacht accommodates 10 Guests plus up to 5 crew. She even features a full beam master with a panoramic view! Outdoor spaces abound. For example , there is the beach club aft with hydraulic swim platform and wrap-around deck. Next, there’s the foredeck sun lounge with c-shaped sofa, table, and sun pads. Finally, don’t forget the 450 square foot fly bridge complete with hard top and retractable sun roof! Luxurious and breathtaking, the Pearl 95 sets a new standard in luxury and performance. Atlantic Yacht and Ship, Inc. is proud to be the USA Dealer for Pearl Motor Yachts. For more information, call our office at 954-921-1500 or email info@ayssales.com.